FORT MEAD, Md. – As we publish this week’s edition, the court martial of Lt. Col. Terrance “Terry” Lakin is underway. With the courtroom filled with his family and supporters, Lakin pled guilty to four counts of disobeying orders on the first day of his trial, with one count dismissed as redundant at the request of his Attorney Neal Puckett. Judge Denise Lind immediately convicted Lakin once he pled guilty to the charges, a normal process for military court. Lakin, an Army flight surgeon with an 18-year exemplary record, who made the soul-searching decision to disobey orders knowing he would be inviting his own court martial, believes the questions surrounding Obama’s constitutional eligibility still need to be answered. Puckett, who took over as defense counsel after Lakin was denied any discovery regarding Obama’s eligibility as a defense, said Lind ruled correctly. In explaining how the military justice system is really more of a disciplinary system, Puckett, a retired Marine Corps Col., stated the military must maintain strict order at all times, even under the change in leadership. And, he said, the orders to deploy came from Lakin’s superiors, not from President Obama. Although Puckett said, had he been Lakin’s counsel at the onset, he would have advised his client to take a different approach to taking on the issue of Obama’s legitimacy rather than disobeying orders, he called Lakin’s decision a courageous act of civil disobedience. Puckett also said those who support Lakin’s actions need to support him and his family after the court martial as well, stating Lakin took his oath to uphold the Constitution seriously enough to place his military career on the line for them. Lakin believed this would be the only means to reveal the truth about Obama’s constitutional eligibility after all other efforts through his chain of command failed. The trial continues, as of this writing, with what some say is the most serious charge of “missing a movement,” to which Lakin has pled not guilty. During opening arguments, Puckett stated Lakin was charged with missing the movement of US Airways flight 1123. However, he stated, nowhere in his orders, as corroborated during cross examination of each prosecution witness, did it say Lakin was required to take a flight to his destination and that the orders actually allowed Lakin to choose an alternate method of travel. Lakin could be facing up to three years in federal prison if convicted on the remaining charges. Visit www.safeguardourconstitution.com to read updates about Lakin’s court martial and to make a donation. FORT MEAD, Md. – After being convicted on three counts of disobeying orders and one count of missing a movement by a general court martial, Lt. Col. Terrence “Terry” Lakin was sentenced this afternoon to dismissal, six months confinement, and forfeiture of all pay and allowances. Dismissal from the military as an officer is equivalent to a dishonorable discharge and essentially eliminates Lakin’s right to all benefits incident to his military service. Unless granted a deferment, Lakin will begin his sentence of confinement today. If his sentence is approved by the convening authority, Lakin’s case, because it includes dismissal, will be sent for automatic review by the Army Court of Criminal Appeals (ACCA), which has the authority to overturn his convictions. 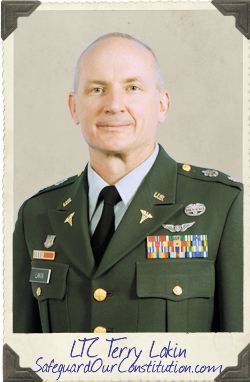 Maj. Gen. Karl Horst, Lakin's commanding general, could also grant Lakin clemency. If the ACCA upholds Lakin’s convictions, he can appeal to the Court of Appeals for the Armed Forces (CAAF). If the CAAF agrees to hear Lakin’s appeal but denies it, Lakin can appeal to the U.S. Supreme Court, which rarely grants review for appeals of military justice system decisions.